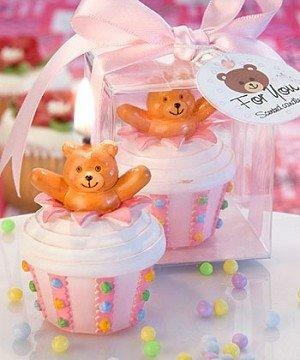 Give your guests a teddy bear-inspired treat with these delectable pink cupcake candles as your baby girl favors! This charming character is sure to make your guests smile. And, she’s bursting with excitement right out of a cupcake candle that looks good enough to eat! Each candle measures 2” x 1 ½” and is made of scented wax in the shape of a cupcake enhanced with pink and white frosting and multicolored sprinkle decorations, with an arms-wide-open, smiling teddy bear extending from the top. A favorite as a girl’s first birthday favors and for baby showers, Christenings and all other baby girl themed parties, each comes in a clear box with a pink and white polka dot bottom, tied with a pink satin ribbon and an attached matching design “For You” tag with scented candle description.